The Colony Bat House Bat Box is a triple-chambered nursery capable of accommodating dozens of mature bats and their offspring. Etched in brass moon and branded bat picture. Vented and well constructed. Features: Houses many bat families A natural bug zapper! Terrific conversation piece and exterior house accent Encourages bats to be nearby, but not in the eaves of the family home. Note that a single brown bat can consume up to a thousand mosquitoes per hour! More and more people are discovering the advantages of providing housing for bats. 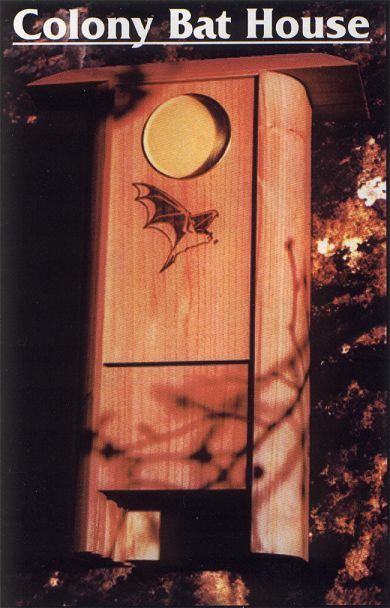 Our bat houses combine artistry and science, providing a safe haven for bats in a handsomely crafted garden accent.